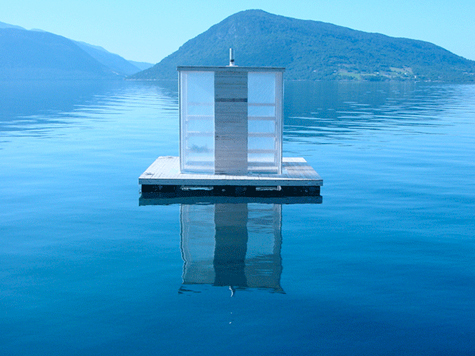 Floating Sauna was a collaborative project between Rintala Eggertsson Architects and students from Västlands Kunstakademie. This project is possible to construct due to the warm Golf-stream meeting the west coast of Norway, keeping the sea ice-free the whole year. "A Finnish sauna room: around 90 C heat is enjoyed, especially in wintertime (-20 C outside) by sitting on wooden benches and throwing water on hot stones on the stove. Sweat and silence, mental purification and physical maintainance. A swim in cold water in between."